Sometimes shows go on a hot streak, cranking out a pack of successive best-of-series episodes. This isn’t the case with “Stranded” and “Space Race,” two back-to-back Timeless episodes of varying quality. It may not be as thrilling as watching a show hit home run after home run, but these two installments manage to illustrate some of the best things about NBC’s time-travel series while also falling victim to some of what holds the show back. One’s mostly a winner, the other not so much, and while the overall effect is still a mostly positive one, it can be useful to use the highs of one to understand the lows of the other. The two most effective episodes of Timeless thus far, “Party at Castle Varlar” and “The Alamo,” have little in common in terms of tone, but the successes of both can be linked to a common factor: they’re character-driven stories. That’s true of “Stranded” as well, the episode that departs farthest from the formula the show’s mostly adhered to thus far by giving our heroes nothing to do but try to fix their time-ship. That means there’s no nefarious plan to unpack, no Rittenhouse mythology about which we’re asked to care, no ludicrously vague Garcia Flynn scenes, needlessly repetitive departure sequences, or shots of the President or a celebrity from behind. All good things, but what really makes it work is that it puts the focus where it should be: these characters, and the talented performers who bring them to life. Unexpectedly but delightfully, that includes the people that Rufus, Lucy, and Wyatt leave behind every week. Jiya speaks! Claudia Doumit isn’t given enough to do to outright steal the episode, but it was so welcome to see agency and development for a character whose primary role, thus far, has been to have hair that blows around when the ship arrives or departs. Her scenes with Malcolm Barrett and Paterson Joseph were both terrific, and if there’s any justice in this world, we’ll get to see more of her work as the show continues. She’s not alone there, either: Joseph’s Connor Mason has more to do than his usual run-of-the-mill vague Rittenhouse banter, and Sakina Jaffrey’s Agent Christopher gets her single most interesting moment thus far when she catches the end of one of Mason’s phone calls. Jaffrey, one of those people who is good in just about everything, has gotten a few punchlines here or there, but now that she’s sniffing out some duplicity, hopefully the amount of work she’s given for Timeless will continue to increase. Still, the real story of “Stranded” is the three people who are stranded in the French and Indian War, a situation that would be trying even if they weren’t still reeling from the twin revelations of Lucy’s future diary and Rufus’s pocket espionage. This trial by fire of sorts may simply be a convenient way to get the characters past these betrayals. That’s fine. It matters not one whit that the central storyline of Timeless doesn’t move forward, because the characters and their dynamic will always be more interesting than the implausible, convoluted story through which those characters wildly reel. I’ll take Wyatt, Rufus, and Lucy figuring out how to repair their ship over another big reveal any day of the week. While each member of the trio does good work, it’s Barrett who seems to be emerging as the show’s MVP (though Spencer’s clearly no slouch, either). As Rufus, Barrett nimbly balances awkward comic relief with heart-tugging simplicity and earnestness, and that’s perhaps never more evident than in this episode. What happens in “Stranded”? Not much, except people talk to each other, make decisions, feel feelings, and generally exist in a way that matters. It doesn’t fit the Timeless mold, and is all the more succesful for it. Not bad for a Monday night. If “Stranded” leaves the Timeless formula behind, “Space Race” picks it up and jogs away with it enthusiastically. To be fair, this is an episode that suffers by comparison in more ways than one. First, it just doesn’t have the heft or the fun of the best Timeless installments, and second, its prescribed emotionally relatable but historically significant character of the week happens to be the subject of an upcoming film (which, granted, most viewers will not yet have seen, but I have, and I can’t un-see it, so here we are). 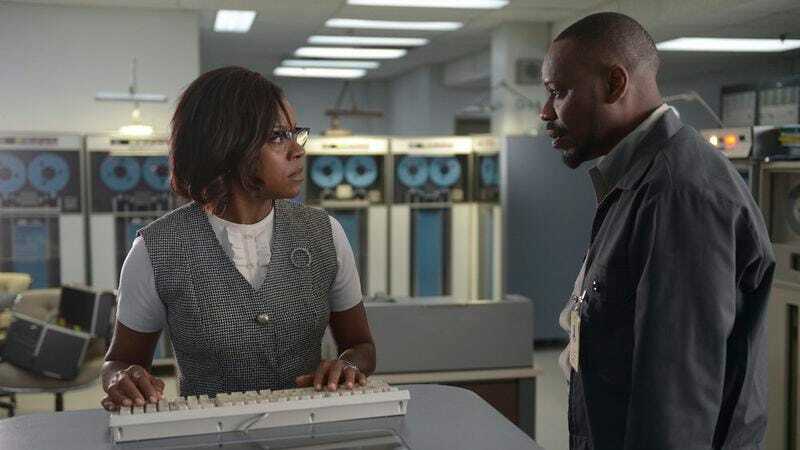 In Hidden Figures, Katherine Johnson is played by Taraji P. Henson, a performer so charismatic that one would honestly consider buying a ticket to watch her play Words with Friends for an hour. Here, she’s played Nadine Ellis, who does a fine job with what little she’s given to do. I’ll admit to knowing nothing about Johnson before the film was announced, and it’s cool to watch such a fascinating historical figure have a moment in the zeitgeist, but Timeless doesn’t serve her particularly well. We’re told she’s the most brilliant person at NASA, but she’s given no significant opportunities to demonstrate that brilliance, and beyond wanting to see the astronauts come home, she doesn’t actually have all that much to do. Rufus is doing all the math; she’s just there to get them in the door and make sure he knows what all the buttons do. While some of the lighter banter remains as fresh as ever, ”Stranded” suffers from a script that seems to put all its eggs in the wrong baskets. The moon landing’s at stake, and we’re troubleshooting a computer and making sure a kid gets saved from a bee sting? It’s not that such stories can’t be compelling, but when the stakes are either clouded (as with Rufus’s rage toward his former colleague) or ignored (no one other than the mother seems to have an emotional reaction to anything in the Wyatt/Flynn storyline), it all becomes sort of a wash of plot with nothing behind the story to make it resonant or exciting. Again, it all comes down to character. These people can be fascinating, but here, Lucy gets a satisfying but implausible takedown of a male NASA employee, and that’s about it. Rufus is dazzled to be surrounded by his heroes on such an incredible day, but then spends the rest of the time thinking about, fighting with, or shooting the companion of Matt Frewer’s Anthony Bruhl—all of which is expertly acted by Barrett, but which ranges from slightly off to wildly implausible or out of character. And poor Wyatt mostly watches things happen for an hour. If Timeless intends to tell a story about a decent, mostly innocent person who becomes a hardened killer through time-travel, well, that is what it is, and it would be great to see what Barrett could do with such a storyline. If they want to tell a story about an ostensible villain who really just wants to ease the pain in other people’s lives through time-travel, then hey, let’s do that. But it’s hard to imagine either of those things being true, which makes those stories both a distraction from the episode’s big arc—saving the Moon Landing—and any overall mythology the show is building. “Stranded” may not have advanced things plot-wise, but it doesn’t matter, because the characters invest in the action, and thus the audience can as well. “Space Race” is too messy to do any such thing, and as such, it falters like the Russian space program after Apollo 11. It’s an episode that checks nearly every Timeless box, up to and including Lucy’s sister and the requisite historical figure of the week, and it’s still a mess. It’s time for Timeless to loosen up the reigns a bit, and to focus on the people, rather than the plot. With a cast like that, any other choice would be pure foolishness. “They made a movie about her.” Does that mean we’re living in an alternate timeline created by Garcia Flynn? The body count on this show is growing far faster than I expected. Due to a scheduling error (on my part), this week means two reviews for the price of one. Next week, TV Club coverage of Timeless will be back to normal, albeit with Bonnie and Clyde in tow.